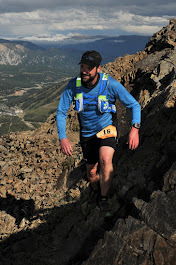 In June, I ran my first trail race and after I finished, I was eager to sign up for my next trail run. Enter: the Catalina Eco Marathon on Catalina Island in Southern California. The location for the race was ideal because my brother as well as some of my relatives live in the Santa Monica area. So, in addition to running in the race, I had a chance to catch up with my family. My mom decided to come out as well, so it was quite the gathering! The race started at 8am which gave me, my bro and mom enough time to catch the 6:15am boat from Long Beach to Catalina. Such is my luck, the only rainy day the whole time I was in Cali was on race day. The poor weather also made for an "interesting" boat ride to Catalina. The ride was about an hour long and the first half went smoothly. However, as we neared the island, the water got rougher and the boat started tossing and turning. I've never thought sea sickness was a problem for me, but the coffee and Clif Bar I had earlier started to yell at me in protest. Somehow I made it to the dock without getting sick, but I can't say the same for my brother (I later heard the ocean swells were about 9 feet!). By the time I got off the boat, I was left with only 30 minutes till race start and I still felt pretty queazy. I quickly hustled over to the packet pickup to drop off my bag and get my bib. By the time I pinned my bib on and headed to the start line, the race was only minutes from starting. I had received an email the day before the race from the race directors stating that they might change the course due to the inclement weather. However, as far as I knew when the race started, we were running the planned course. For this marathon, I had no time/pace goal. Since I knew this was going to be a hilly race, I let the course dictate my pace. I was there to enjoy the sights and I stopped frequently during the run to snap pictures on my phone. Luckily, my stomach had settled down by the time the race began. The first 4 miles were more or less uphill the whole way. By the time I had reached mile 4, I was 1,500 feet above sea level. Due to the low clouds that were hanging over the island, I was running in near white out conditions! When I hit mile 6, the course transitioned from trail to road. I was hoping that this was just going to be a short section of road that would quickly turn back to trail, but as the miles continued and the posted mile boards were replaced by oranges cones & mile marks spray painted on the road, I realized that the course had in fact changed. If an announcement was made pre-race about the course change, I had missed it. I was bummed that I was not going to run the advertised course, but understood that for the safety of me and my fellow runners, it's what needed to be done. Better to change the course then cancel the race. It was evident from the mile markers on the other side of the road that the changed course was now an out & back. It was another bummer as I'm not a fan of out & back courses. On the plus side, the clouds began to lift and I was finally starting to see the sights I had traveled all the way from Washington to see. During the 12th mile, the course entered the grounds of the Catalina Airport. As I continued through the airport, I neared an aid station and saw the turn around sign. Looking at my watch, I still had at least a good half mile to go before I should of hit the turn around. I asked the volunteers if this was the halfway point and they assured me it was. Part of me still didn't want to believe that this was right, but when reached the mile 14 mark with 13 miles registered on my watch, I realized that the new course was unfortunately measured incorrectly. Another bummer. Airport terminal. The white sign on the second level says, "Airport In The Sky"
The middle part of the race was a mix of rolling hills. All and all, I was feeling good. Since I had spent most of the first half of the race to stopping to take pictures, I decided to get into more of a rhythm and lay down some faster miles. When I reached the mile 20 mark (or 19), I was back on the portion of the course that was trails. I knew that soon I'd be facing a 1,500 foot decent down to the finish line. I had burned my quads up a bit by running faster and some recent hills hadn't helped the cause. As I suspected, the decent was pretty tough on my quads. I tried to keep a steady pace on the down hill, but my legs wouldn't let me. It was frustrating. Fortunately, the grade of the decent lessened in the last couple of miles and I was able to up my pace again. As I neared the finish line, I saw my mom and bro off to the side cheering me on. As I approached the finish line, I did something I'd always wanted to do when finishing a marathon... I crossed the finish line running backwards. The official distance was 25 miles, just shy of the marathon distance. Ironically, my first trail marathon course was long by about 1.5 miles... so I guess I broke even! 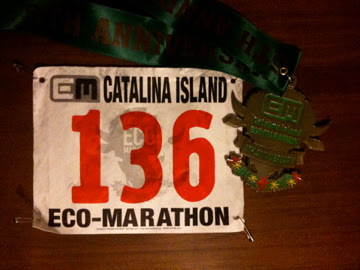 The Catalina Eco Marathon was like none other. I still wish I could have run the original course, but the last minute course change still provided me with some amazing views! I guess I'll have to come back next year and run this race again! A big thanks to my mom and bro for braving the nasty weather on Catalina to support me. It was great to have them there. I'm so grateful for all the love and support they and the rest of my family give me! 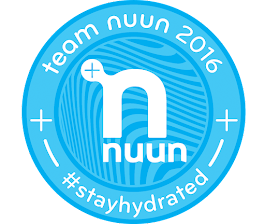 Time: 4:10:05 @ 9:55 min/mile avg.